The Northern Lighthouse Board’s 84m multi-function Tender PHAROS is set to play a significant role at London International Shipping Week this September. PHAROS will be berthed alongside HMS BELFAST in the Thames to provide a venue for seminars, meetings and receptions, including the hosting of a major careers event for Maritime UK. PHAROS’ usual home is Oban, Scotland and she works mainly in Scottish and Isle of Man waters. In addition to her primary role to respond to wrecks and new navigational dangers, the vessel supports the maintenance and refurbishment of NLB’s 200 plus lighthouses as well as conducting buoy operations. PHAROS came into service in 2007. She is equipped with dynamic positioning, a 30 tonne crane, a hydrographic survey suite and is capable of supporting helicopter operations. 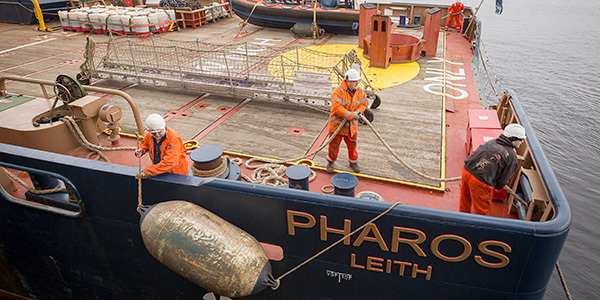 The work of PHAROS and her crew was recently featured on the BBC’s Countryfile Winter Diaries. And earlier this year, NLB’s Patron HRH The Princess Royal was interviewed on board PHAROS for the BBC1 programme The One Show.